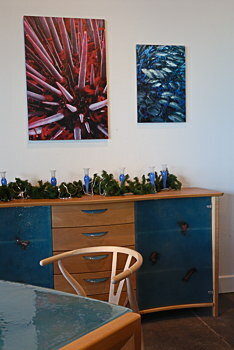 Selected underwater photographs from the Solomon Islands and Southern California are now available at SCAN Furniture House in San Diego. The vivid color photographs in this exhibit compliment the contemporary and Scandinavian furniture that SCAN is known for. SCAN’s modern atmosphere is an excellent place to see many of the fine art prints available on wildoceanphoto.com. SCAN Furniture House is located at 7340 Miramar Road, Suite 106 in San Diego California.